One upstate New York resident on the shores of Lake Eerie made the smart choice one night to not drive home drunk, but he made the wrong choice in parking so close to the lake. 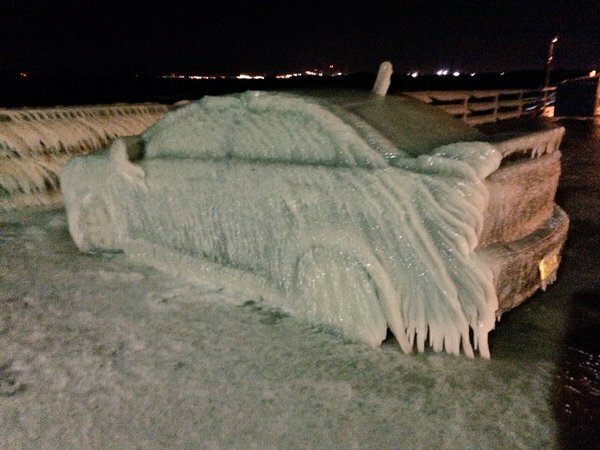 When Justin Yelen, 24, came back to get his car the next morning he found it completely encased in ice. Apparently the below freezing temperatures and hard wind with blowing water had created a layer of ice at least an inch thick that covered the car as well as nearby railings and anything else in sight. A photo by local news reporter Matt Bove with WKBW Channel 7 in Buffalo has since gone viral, appearing in news broadcasts on Good Morning America and ABC News. In joking with a reporter, Yelen said he had no idea how to get the car out. “I hope summer comes soon,” he said. Some viewers commented that he should get an industrial drier to melt away access to the driver’s side door and start the engine. From there it’s major defrost time. Yelen’s father said they planned to tow the car to a warm garage. One thing’s for certain. That’s one big Popsicle.